Super Mario Bros. 3 opened with a rising curtain. The end credits brought that curtain down, completing the idea that Mario 3 was a stage performance. Clever. That’s indicative of Nintendo’s platforming touch. 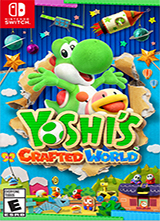 Enter Yoshi’s Crafted World, not a stage show, but a video game projecting the imagination of a small child. This serene Yoshi jaunt isn’t without cliché – desert worlds, lava worlds, mine carts, and other elements inspired by countless others in the medium – but here that makes sense. It’s a world designed as if a child were behind it all; they create and mirror what they see. What they see is video games. Think of a toy commercial from the ‘80s, where kids launched G.I. Joes across realistic landscapes and miniature forests, knocking over Cobra action figures. It looked cool. Crafted World is what happens when a kid tries to make those commercials. But on a budget. And only with found objects. The desert marches Yoshi across a sandbox. You can tell. In the background, sand castles, pressed together form the form of a plastic mold, sit against a wooden fence pulled out of a middle American cliché. This level takes place in a backyard, sun shining, instantly nostalgic, and infinitely welcoming. Bottle caps lie half-buried. A plastic bottle becomes a hidden tunnel. Lava? That’s a kitchen disaster where Jello stands-in for magma. Mom won’t be happy. This isn’t only sand or Jello; it’s cardboard too. Who knows where all this came from (and certainly, this subliminally sells Nintendo’s Labo accessories), but it’s strung together with “borrowed” scotch tape and stacks of band-aids. Another level is colored in by markers. Someone is recreating the dynamic look of Yoshi’s original low-key classic, Yoshi’s Island. By now, it’s clear how this fits together. 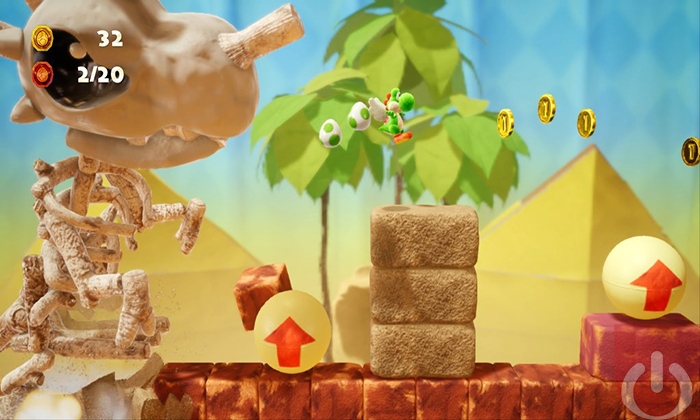 Yoshi previously starred in video games rendered like clay, like wool, and like paper. Or, even a lullaby in Yoshi’s Story. Each is an interpretation of grade school arts, arguably a bit better than the talents of a typical seven-year old, but that’s the charm. This is how kids see their work, not only what they made. Yoshi’s Crafted World is equivalent to a refrigerator-worthy drawing, brought into 3D with an absolute chill demeanor. And sound too, where Yoshi’s shoes softly patter on sand and plop when inside a plastic bottle. The charisma keeps coming. 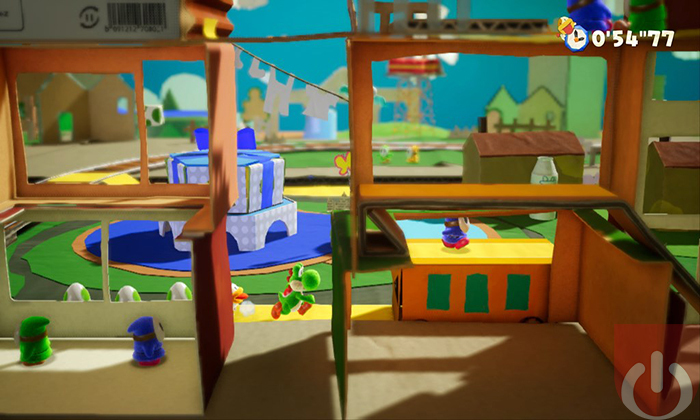 In Crafted World, some levels flip around, double sided, played in a reverse perspective where the makeshift stitching becomes visible. Handmade mistakes show through, and that’s okay. Imperfection is the charm. Yoshi’s Crafted World isn’t inherently different from its predecessors. Yoshi launches eggs, stomps on (literally) shy guys, and solves easy going puzzles. Mundane in any other sense, but the ingenuity of these designs (and the ability to walk into and out of a flat plane) keeps going. No two levels do the same thing. Riding a train, one made from a juice container, comes into play a few times, but in each circumstance it’s refreshed. There’s that kid again, manipulating toys with infinite creative spark and few limitations. 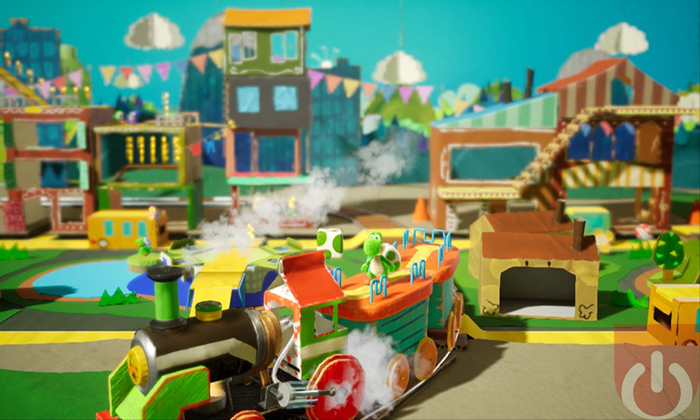 Once in Crafted World, Yoshi becomes a giant, smashing cardboard cars like Godzilla. In another Yoshi’s dueling with ninjas and their throwing stars made of aluminum foil. There’s a cheapo dinosaur model that chases Yoshi around in one panicky level. A boat ride becomes a thrilling pirate escapade, complete with cannonballs. Anything that comes from a whimsical spark, like a daydream come to life from the most talented of talented kids. Or, just the most delighted. Flush with imagination and cleverness, bouncing through these ever varying worlds is accessible bliss. It’s always something new, to do and see. Cardboard looks like cardboard, but it’s not about realism rather the aesthetics of paper products and how they create worlds. Crafted World primarily features one, easy-listening theme, but that’s changed and tweaked depending on the levels, with space-y harps to lower tempo drama when near danger. Collectibles reach for platforming par, while the addition of flipped levels increases the hunt for found objects, revealing new splashes of creativity thanks to the perspective.